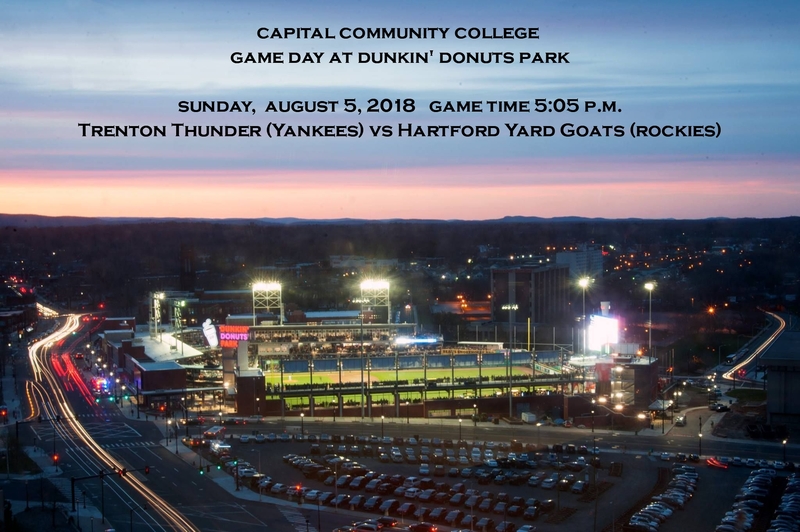 Join us for the 2nd annual Capital Community College Day at Dunkin Donuts Park on Sunday, August 5th with a Double A Eastern League game between the Trenton Thunder (NY Yankees) and the Hartford Yard Goats (Colorado Rockies). The game starts at 5:05 p.m. and seating is next to the Yard Goats dugout on the 3rd base line. Make a reservation for the Dugout Suite (closer to the catcher than the pitcher is). Dunkin Donuts Park is a short walk from the Capital Community College campus. Your ticket ($60 per person) includes a 2.5 hour buffet served until the 7th inning, private (cash) bar and access to the YG Club. The dugout suite menu includes: sliced prime rib, rliced roasted turkey, roasted red bliss potatoes, artisan bread rolls, cucumber feta salad, chocolate chip cookies and non-alcoholic beverages with a cash bar service.